Fine Paintings and Sculpture sale included a number of important works of Aboriginal art. Prices for the Indigenous paintings on offer were solid although not any higher than they were a few years ago. All the Aboriginal works sold by Menzies had been through their salerooms in past years and had achieved relatively the same prices. Although this may not appear to be a positive sign, the fact that the prices for these paintings have not declined is good news. 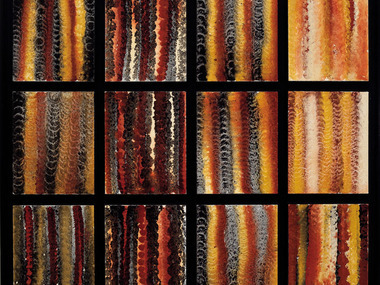 A spectacular 12 panel painting titled Body Design by Emily Kngwarrere was the Indigenous highlight of the sale selling for $98,182 (hammer price of $80,000) against an estimate of $60,000 - 80,000. Previously sold by Lawson Menzies in 2009 for the same $80,000 hammer price, the painting is an important work that has been exhibited in a number of important exhibitions in Japan and Australia. 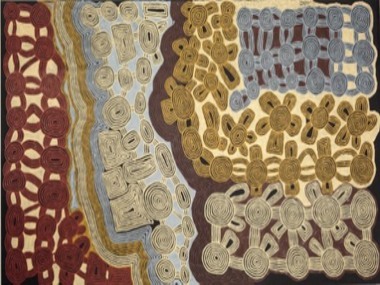 Ronnie Tjampitjimpa’s Tingari Cycle was another highlight of the sale selling for $49,091 (inc. premium) against an estimate of $40,000 - 50,000. The painting was last sold by Lawson Menzies in 2008 for $48,000 (inc. premium). A watercolour on paper of the MacDonnell Ranges by Albert Namatjira achieved a hammer price of $22,091 against an estimate of $22,000 - 24,000 after being sold by Menzies Art brands less than a year ago for $18,409.